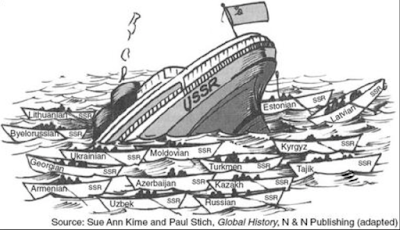 Stories and Archives : Grading: The Soviet Union goes bankrupt. Joins Ukraine. Grading: The Soviet Union goes bankrupt. Joins Ukraine. *hopefully students demonstrate their understanding that the USSR existed and then ended. Most got it right. Here are some of the rest. The Soviet Union goes bankrupt. Joins Ukraine. The USS Were joined countries that were against us, like Russia and Cuba. A ship full of bombs pulled up next to a US ship in Iraq and bombed it. Significant because it pissed off Americans that these terrorists were bombing everything. This was about a ship sailing when another ship pulled up next to it and let a bomb out. A ship destroyed by terrorist known as Al Qaeda, led by Osama bin Laden. A group of Americans that cared for the US make some of their battle actions actions the Middle East. In 1945 a US ship was transferring parts of the Little Boy atomic bomb when a Japanese missile hit the boat and sank it. There were 1,196 men on that ship, only 317 survive.